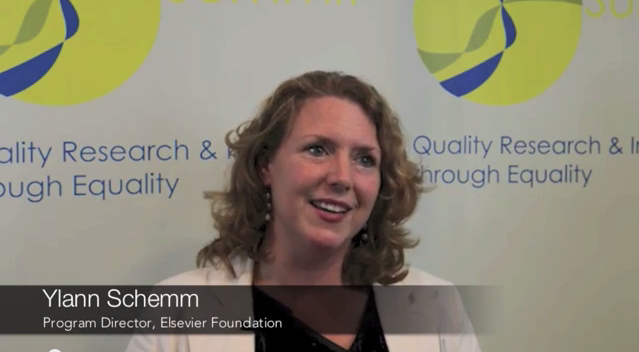 In June, Ylann Schemm, head of Elsevier’s Corporate Responsibility program, attended the Gender Summit 4 – Europe 2014, From Ideas to Markets: Excellence in mainstreaming gender into research, innovation, and policy. Ylann’s interview can be seen here: Gender Summit Speaker Interview – Ylann Schemm. The Gender Summits are dedicated to supporting and advancing excellence and effectiveness of research and innovation at all levels, through the inclusion of gender. The overarching theme of the events is “Quality Research and Innovation through Equality”. The European Gender Summits provided a forum for stakeholders from research, industry and policy to jointly explore how gendered methodologies can stimulate innovation and advance scientific excellence. The summit mapped the current state of knowledge, provided a forum for interdisciplinary debate and drew up concrete action plans for research and innovation policy. “The 4th Gender Summit is focused on Horizon 2020. There’s a lot of money at stake in Horizon 2020 and the new rules ensure that women are at the centre of the decisions on how it should be spent and at the heart of the research and innovation that is funded. Horizon 2020 provides a clear incentive to applicants to ensure a better gender balance in their research teams.